This is the epitome of comfort food to me. I can't make it without feeling like I'm 9 years old, back in my grandmother's kitchen, hoping that one day I would be able to make these cookies as well as she did. Wheel of Fortune would've been on and Grandmom would've been drinking her coca-cola while talking and laughing loud enough to be heard over the TV in the background. There were always plenty of sweets at her house, but these were especially my favorites. You may have seen these or even had them with chocolate on the bottom, but we never made them that way. When you leave the chocolate off, you get a gorgeous golden color all around and a deeply satisfying toffee taste. They are so simple to make and I've never met someone who didn't enjoy them. However, I've also never met someone who loved them as much as Grandmom and I do! I think I like the cookies so much because there are so many memories of her wrapped up in them. Think I've use this recipe a few times?! Yes, that's butter AND margarine. Don't ask me, ask Grandmom! I had forgotten how good graham crackers are on their own! Had a few and felt like I was back in Sunday school. Helpful Hint: nuts are cheaper at Aldi or in bulk at Costco or Sam's. If you can help it, don't buy them in the baking aisle! 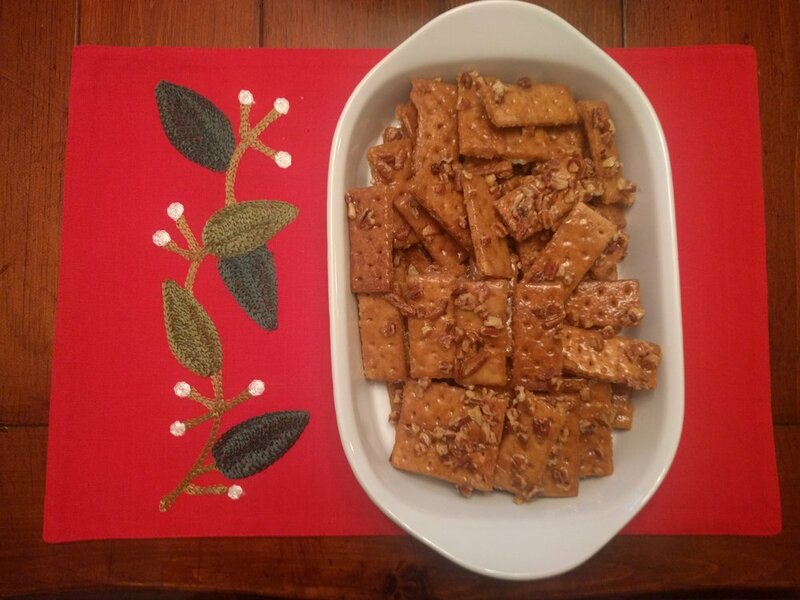 Fill a cookie sheet with the cracker pieces by placing them side by side. Melt butter and margarine together then add sugar. Cook butter/margarine/sugar for 3 minutes on medium heat. Use a BIG spoon (I use a ladle) to pour mixture over the crackers on the cookie sheet, saturating each cookie. Use all the mixture. While the cookies are baking, line counter or table with two large sheets of wax paper. Take the cookies out of the oven as soon as the 10 minutes are up and use a spatula to transfer from the cookie sheet to the wax paper. What family recipes do y'all enjoy during the holidays? Comment below to share the wealth!